The Local Havana With a Private Guide. Walking through the histories of Havana! Reynier was an outstanding guide. We thoroughly enjoyed our time that we spent with him in Havana. He was knowledgeable and fun and paced the tour correctly for us. He took us to a great spot for lunch that we would never have found ourselves. We highly recommend him for anyone who is interested in getting a flavor of Cuba. Our driver, also named Reynier, was very pleasant and drove us around in a classic car. TOUR GUIDE RESPONSE: Thank you for your nice comment. I'm very happy to hear you had a good time. It was a great pleasure to show your around and share my city with you. Reynier was outstanding. He knew the cultural, historical and current events in equal measure. Would recommend him to all who are interested in a broad exposure to Cuba in general and Havana in particular. TOUR GUIDE RESPONSE: Thank you for taking the time to leave a comment about your experience and tour. It was a pleasure to guide you and I hope you make it back to Cuba soon. Reynier was an amazing guide. He has perfect knowledge of Havana and local culture. His English is flawless, he is great with kids, and funny. Highly highly recommend. Reynier was hands down one of the best tour guides I've ever encountered in my travels. He was extremely knowledgeable, kind, and flexible. Reynier - thank you for such a beautiful day and amazing conversations! TOUR GUIDE RESPONSE: Thank you for your very nice comment. Guiding people like you and your friends is what makes me love to be a tour guide. Thank you for the great day and everything I learned about your culture. I hope to see you soon in LA or Iran. If riding on a tour bus with 50 other tourists doesn't sound that appealing to you, then consider spending an afternoon with Reynier who will give you a true local's view of Havana. Easy-going and knowledgeable we had a great day with this young man getting to know this unique city from so many different perspectives. Money well spent and a most enjoyable experience. Reynier made our visit to Havana most memorable. He communicated with me via email to come up with a perfect itinerary. Reynier is personable. Within minutes of our meeting, we felt comfortable and at home in Havana. He was agreeable and flexible. When one person in our party announced she'd like to have a tattoo, he made it happen. When another person in our party needed pain reliever, he took us to a pharmacy. He is educated, well-spoken and speaks English well. We highly recommend Reynier. Reynier was an amazing guide! His knowledge of the history, locals, neighborhoods & culture of Havana was outstanding. He treated us as friends from the moment we met. He took us to the places we asked to visit along with many other spots & shared stories, history & details we never would have discovered on our own. We had a 6-hour tour with Reynier & the time just flew by! We highly recommend Reynier for your Havana experience. It was sad to end our beautiful day & hugged each other as we said goodbye. TOUR GUIDE RESPONSE: What a nice comment. Thank you so much for your beautiful words. It kind of nice when I have a whole day with people and at the end of the day we had such a nice time that we don't want it to finish. As you said: our day was too short but I will just take it as a way to make sure that we will be going around the city in another time, hopefully soon. Highly recommend Reynier if you're looking for a tour of Havanna's art scene like we were. He had an amazing depth of knowledge and was an all around great guide! TOUR GUIDE RESPONSE: Thank you so much for taking the time to write a comment. It is very important for me to get feed backs from customers to always improve the tours. We had the most terrific day with Reynier! He is totally charming as well as being so informed. Unfortunately we had only one day in Havana (not enough) but we did all we could in the time we had. I would recommend Reynier with the highest accolades, he was great and made our short time there completely enjoyable. The driver he had for us was also wonderful. TOUR GUIDE RESPONSE: I have such a nice day. Thank you for being so curious and interested in Cuban history, culture and life. It was a great pleasure to take you around. Thank so much also for taking the time to write such a nice comment. Hope to see you back in Havana to go through the rest of the city. Reynier is a wonderful tour guide. His knowledge of Havana, the arts and the culture is more than anyone could ask. He will work with you to make your tour however you would desire. We invited our friends on our trip along on our tour. These are very well seasoned travelers and we felt somewhat responsible for selecting Reynier for this important day in Cuba. The friends told us this was the best guide they had ever experienced in over 40 years of travel!! Reynier is truly outstanding!! Reynier was very knowledgeable and charming. We asked a lot of questions about what it's like to live in Cuba today and he was very responsive. We were hungry and asked him to take us to a place he would go to lunch and it was the best meal we've had so far! He really enjoys talking about politics and we had an enlightening and engaging discussion. His driver was quiet and charming and the car was spotless!! TOUR GUIDE RESPONSE: Thank you so much for taking the time to write a comment about the tour. It was a great pleasure to guide you around Havana and also talking with you. I always enjoy to share my knowledge with people but more when I am also learning. Thank you for such a great day. Reynier did a fabulous job. Very knowledgeable, talks English perfectly and would highly recommend him. TOUR GUIDE RESPONSE: Thank you so much for taking the time to write a comment. It was a great pleasure to guide you around and show yoi a litter bit of my city. I hope you will manage to come back for another tour. All the best for you and the rest of the group. Reynier was great. Showed us a wide range of Havana sights, and was very knowledgeable about the history and current events of Havana. A very personable guide and was very accommodating to our preferences. We Highly recommend this guide and tour! TOUR GUIDE RESPONSE: Thank you for your nice comment. It is always nice to see that customers feel happy about their experience in Cuba. I was a great pleasure to show you around my beautiful city. We enjoyed viewing Cuba as we entered in topside on cruise ship. Seeing the classic cars & colorful old Havana. Very smooth thru customs & inspection. Very happy to meet our guide Reynier in the square across from port. We conversed a few times prior to our trip & I felt like I met an old friend. He showed us all around & was quite knowledgeable. My husband loved talking to him about the history/politics of Cuba. I loved the people. The children playing in the square & later soccer in the rain. TOUR GUIDE RESPONSE: What a nice comment. Thank you so much to take the time to write such a sweet review of your experience. I am so happy you enjoyed your time in my city and all its attractions. I also had an amazing time taking you around and showing around. I have to also thank you for your the nice vibes and chat. Hope to see you guys one day back here. We thought Reynier was excellent. He had great knowledge of the city, provided us with great historical information, all in all a tremendous experience. Thank you Reynier, highly recommended. TOUR GUIDE RESPONSE: Thank you so much for taking the time to write a comment. It is highly appreciated. Hope to see you back in town soon. What a wonderful guide! We were 3 couples with different interest and Reyniers' tour kept us all interested. Reynier is very passionate about Cuba, yet traveled enough to be knowledgeable on world affairs as well. From fortresses being taken, to missile crisis, he had all the answers. From lunch together in that perfect restaurant, to that hidden, not crowded, cigar shop, he knew all the right places. Thanks Reynier for a fabulous taste of Havana! TOUR GUIDE RESPONSE: Thank you so much for your nice feed back. I really appreciate when travelers take some time to let me know their opinion of the tour. I am happy to see you enjoyed Havana and hopefully we will go around again one day soon. Great tour for family of four's first visit to Havana. Reynier was excellent. Great communicator about both cultural and social topics. My teenage kids really enjoyed speaking with him. Although it was a walking tour, my wife fractured her foot before the tour and was in a walking boot. Reynier was very accommodating and walked at a good pace and arranged for a car for the afternoon to see more exciting sites. Highly recommend him. TOUR GUIDE RESPONSE: Thank you so much for your commend. I am happy to hear you enjoyed your time in Havana and I hope you guys come back to see the rest of the country soon. Good luck with everything for the whole family. A wonderful day in Havana! I would recommend to add on a drive in a classic car.. it even had a/c!!! He was a delight and our entire family enjoyed the tour and information..book with him if you want a perfect day in Cuba! Thank you for making our day great! I had no idea about this web site when I began the booking. Over the few months that I began the process Reyneir exchanged a few emails about the tour since I wanted it to be interesting to my 12 year old grandson. To say the tour exceeded our expectations would be an understatement. Reyneir and Carlos his driver provided an intimate look into Cuba, the art and cultural side, history and food and drink. Reynier is one of the best tour guides I have ever used. TOUR GUIDE RESPONSE: Thank you so much for you nice commend. I had an amazing day with you and your grandson. It is always a great pleasure to guide travelers that not only are very interested in the culture and history but also have a lot to say and share. see you hopefully soon. This was a great tour that went outside of Old Havana and highlighted some of the amazing art in Cuba. A visit to Fusterlandia was amazing as was a visit to the Afro-Cuban art colony along Callejón de Hammel. Reynier was an excellent guide and had a vast knowledge of the art scene in Havana and was an enthusiastic and charismatic guide! Highly recommend this tour and especially with Reynier. He was awesome. He took me to an amazing pasta paladares near University of Havana. TOUR GUIDE RESPONSE: Thank you so much for your very nice comment and for being such a nice person. I hope I will see you back in Havana or in CA very soon. It was great to have you in our BBQ. Reynier was great! He had an amazing knowledge of his city and it's history! He was very accommodating to things that I was interested in and he had a phenomenal personality. I really appreciated his love and knowledge of the arts. I highly recommend Reynier! Reynier was fabulous. His knowledge of not just Havana but Cuba as a whole was staggering and made our two day tour of Havana interesting, educational, and action packed. Will not hesitate to recommend him to anyone wanting a tour of Havana. TOUR GUIDE RESPONSE: Thank you for you sweet comment. It is always a pleasure to guide nice people around my city and share everything I know with them. Hope I will see you again soon here or somewhere in the world. Reynier is a very well educated young man. He showed us Havana on foot and took time to make sure all the places on his excursion plan were seen. We spent 2 hours for lunch that was fabulous and traditional food. The restaurant owners took such great care of our needs and made the experience fun. We went to a cigar factory and had an amazing tour and presentation of the cigar history and making. Reynier picked us up the time and place designated and returned us to the ship in 6 full hours. TOUR GUIDE RESPONSE: Nothing make me feel more happy than readying this very sweet comment. Thank you so much not only for taking the time to share about your experience in Havana but also for making very easy easy my job showing you around my city. Hope to see you guys back in town soon. This was an interesting 6-hour tour, including a ferry and taxi ride. TOUR GUIDE RESPONSE: Thank you for your comment. I am happy that you found the tour interesting. Hopefully when you come back to Havana we will have a better weather that allow us to enjoy more our time in the beautiful streets of Havana and its life. Reynier was fantastic! We spent two full days seeing Havana at our own speed with a very knowledgeable guide. While he demonstrated knowledge in all the areas we visited, he has particular expertise in art, and we enjoyed the public art installations through which he guided us. You will be happy you chose this guide! TOUR GUIDE RESPONSE: I am so happy to read this. Thank you so much for taking the time to write this sweet comment. It was also a fantastic time hanging out with you in Havana. Reynier was fantastic! He was very knowledgeable about the architecture and history of Havana. An added plus was his ability to discuss art and point out the meanings behind many sculptures and statues around Cuba. We couldn't have asked for a better guide thru this amazing city. TOUR GUIDE RESPONSE: It is always great to have travelers interested in Cuban art and show them around my favorites spots. Thank you so much for such a wonderful time and for this nice comment. Met all of my expectations. Reynier is a fascinating person to converse with; as a tour guide, he is a jewel. During our day trip, my wife had a trip and fall accident. Reynier helped us bandage her wounded knee and structured the rest of the day to make her comfortable, so that even though we had to slow down the activity level in Havana, we still had a wonderful and educational experience. TOUR GUIDE RESPONSE: Thank you so much for your comment. I am sorry about the accident but at the same time happy to hear you ended having a nice experiences of the tour. Hopefully, I will have you back soon in Havana to see the rest of the city. Reynier overwhelmed us (in a good way) with facts, history, local politics and much insight into Cuba and Havana. We especially enjoyed seeing the barrio of Jaimanitas and the work of Jose Fuster; that was amazing and something we would not have found by ourselves. We also enjoyed looking back at the view of the city from across the water (by the statute of Jesus). Reynier was flexible and accommodating. Reynier was an excellent guide, we got a really interesting overview of Havana and its culture. His English is excellent and he was fun to be with for the day. Recommended. Reynier is great guide for two Americans who were testing the newly allowed opportunity to visit Cuba. He walked us all through the old town areas in Havana with great descriptions of the history and sites. The highlight of our day was lunch in a small hidden cafe that Reynier knew with great local food and beer, and, possibly the friendliest staff in Latin America. We had a great time in a city that still harks back to the 1950's in many ways! Thanks. 6 of us Geocachers wanted to tour Havana, visiting the sites & also finding the local geocaches. A list was sent to several guides & Reynier supplied the best response. He enthusiastically delivered an excellent tour, including researching our requests & preparing the drivers to go exactly where the geocaches & sites were. The tour wasn't without glitches but Reynier took them in stride & resolved them. He also added the wonderful Fustlandia which hadn't even been on our radar. Wonderful intro to Cuba! TOUR GUIDE RESPONSE: Thank you so much for taking the time for this beautiful comment. You guys made it easy for me; I had such a good time and also learned a lot with you and your very sweet group. Organizing tours and working with people like you all is what makes me feel so happy to be part of the ToursbyLocals experiences. See you soon for some more geocaching. Reynier is a wonderful guide. He is intelligent, charming and ever flexible during the tour. He loves Havana and by the time he shows it to you......you love it too! Reynier did an excellent job communicating with us before our arrival in Havana and had our day and a half of tours very well organized. There were six of us, not easy for anyone to control, but Reynier was very patient and positive. He paced our touring very well and made reservations for delicious local meals and even a break to experience some locals beer and drinks. Reynier was able to share lots of historical, architectural and cultural information with us and answer our questions. He was excellent. TOUR GUIDE RESPONSE: Thank you so much for taking the time to review this tour. I also had a great time with you guys and hope you will be back to Havana soon. Happy New 2018!!! We booked two tours with Reynier and were very happy. He was an excellent tour guide and we had a great time in Cuba. He responded quickly to my emails and was accommodating regarding our needs and requests. Both the Art, Tradition and Culture tour and the Walking Tour were excellent and we would recommend Reynier without reservation. TOUR GUIDE RESPONSE: Happy New Year!!! Thank you for your beautiful comment. I really appreciate when people take some time to give me a feel back about the tour. Thank you and I hope to have you back in Havana one day soon. Reynier is a young man with a deep understanding of Cuba, its culture, and political background. It was great to ask questions about the culture and life under Castro and the relations with the international world. We continued our cruise of Cuba with a solid understanding of Havana. He leads a quickly paced tour and took us to a great local place for lunch. Highly recommend. TOUR GUIDE RESPONSE: Thank you for so much for your comment. Having your feed backs always make us want to improve our tours and learn more about the culture and history of my city, country and the world. Reynair was great. Highly informative and interested in making sure you were getting the most out of your tour. He was also able to converse on all topics and had a refreshing outlook on his Cuban culture past and present. TOUR GUIDE RESPONSE: Thank you so much for taking the time to submit a comment; I appreciate a lot. I am very happy to hear you enjoyed your time in Havana. Reynier was very easy to deal with. He took us all over and was happy to do anything we would have liked. He took us to a great local place for lunch. Many thanks for a lovey day in Havana.............even in the rain! A great art tour! After reading the reviews, we expected a lot, but it was even better. Reynier has a university degree in art literature and knowledgeably showed us the art scene in Havana and beyond. While focusing on art, he shared Cuban culture and history and answered any questions we had. Used a vintage 1950 Chevy with great air-conditioning. Lunch in a quality restaurant with great food and even greater drinks, cocktails and juices. I would encourage you to take advantage of Reynier's great tour! My friends and I highly recommend Reynier. His tour of Havana was amazing. 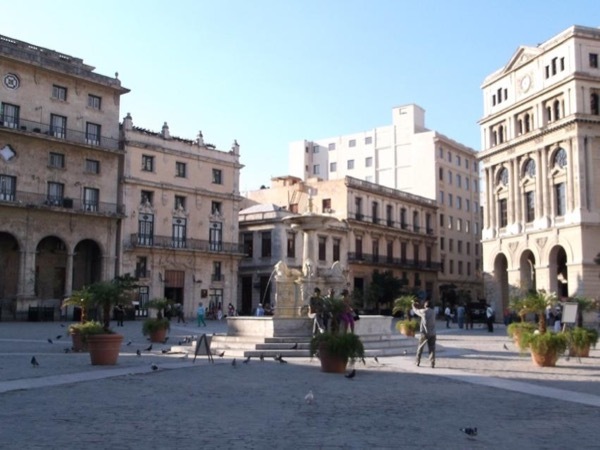 He provided fascinating historical background and interesting cultural details on Havana. Reynier is extremely friendly and easy going. He has a great sense of humor and had my friends and I laughing throughout the tour. His restaurant and bar recommendations were perfect. He went above and beyond our expectations and made our trip to Havana truly wonderful. Our guide Reynier gave us an excellent tour of Havana - he showed us several interesting points of interest including Havana forest which many visitors are not even aware of. He was helpful and informative to my wife and I answering all of our questions. Reynier did a fabulous job with our tour. Very professional. He was most attentive and made sure that we saw all the important sites in Havana. He was very knowledgeable of the architecture and history of Havana. He went out of his way to take us to a jazz club in the evening and spent the entire evening with us. This was above and beyond the call of duty of a guide. TOUR GUIDE RESPONSE: I am so happy to know you enjoyed the tour. I had an amazing time with you and your family and it was a great pleasure to share my Cuba with you. Hope to see you soon around Havana again. All the best of this beautiful family. We had an awesome time on our People to People tour with Reynier. He was very accommodating and engaging. We really appreciate going to a farm house. Everyone had a fantastic time and we highly recommend him. Reynier made our first visit to Havana very special. His English is excellent and he is extremely knowledgeable about the country that he loves as well as what's going on in the rest of the world. We thoroughly enjoyed our time spent with him and would highly recommend him as a tour guide. TOUR GUIDE RESPONSE: Thank so much for your comment. I am happy to hear you and the family enjoyed the time we had in Havana. All the best for all of you. Reynier was wonderful at planning our itinerary, finding scenic and delicious places to eat, and he could translate for us. We were able to ask as many questions about the culture as we liked. Our guide was very knowledgeable and allowed us to see how Cubans really live. Reynier was a fabulous tour guide and quick to respond. He was also an extremely pleasant and interesting person to be with. His English is excellent and he was amiable to changes in our itinerary. His knowledge of the history of Cuba is most impressive as is his awareness of talented local artists. We very much appreciated his selection of restaurants for lunch and drinks, so much so that we returned one evening on our own to experience it again. I would arrange for his services again in a heartbeat. TOUR GUIDE RESPONSE: It was a super great pleasure to take you around. I had a wonderful time with your group and I hope to see you guys soon. Thank you so much for your nice commend, if I would have to rate you guys, it would be a 100 stars. Hugs for everybody. Trinidad and Santa Clara are a must-see while in Cuba, and I don't believe you will find a finer guide than Reynier. Very happy with the tour! We wanted to see the artistic Havana and Reynier prepared exactly what we were looking for. He also adjusted the schedule as we wantedto visit artist workshops, to see how they work adn to listen and talk to them about their work. Reynier is a great person! Very approachable and knowledgable. It was important to us to learn as much as we could about history of Cuba and understand it better. We are very pleased! Thank you! Reynier was terrific. He is knowledgeable, informative, pleasant,well-spoken. He made our Havana stay better, and for the following four days of our stay, we kept referring back happily to our time with him. He is a credit to his city, his country, and your firm. TOUR GUIDE RESPONSE: Thank you so much for your comment. I am so glad you enjoyed the tour and the rest of your time in Cuba, it makes me feel more proud of my country everyday. Hope to see you soon back in Cuba. We enjoyed our tour with Reynier very much. We had asked for a couple of things we were interested in, and he had them all lined up for us. He was knowledgeable and forthcoming in answering all of our questions. He took us to a local artist colony which was wonderful. We had a great day with Reynier. We visited several local community art projects, Hemingway House and Hotel Nacionale. We drove around and saw local areas and at the end had a really nice meal at a local Havana restaurant. Best of all, Reynier was very knowledgeable about history, both current and past. We really enjoyed Cuba and this was a great way to end our visit. We had a fabulous time with our guide Reynier . He was excellent and we had such a wonderful time experiencing Cuba . His recommendations on what to see and do were great . We love Food and all his recommendations on where to eat for dinner were great and where we went for our Lunches were amazing & good . Reynier took us to some of his favorite local places which we loved . Our driver was also very good and we can't wait to return to Cuba . TOUR GUIDE RESPONSE: Thank you for your comment. I had a great time with you and I hope you will be back to Cuba soon. I am happy that you enjoyed those places we went for our food, hopefully I will have some new places next time. TOUR GUIDE RESPONSE: Thank you, Mrs. Shere for your comment, it was a pleasure to guide you around my city. I wish a great upcoming year for you and your friends. We enjoyed our tour very much with Reynier. He was on time at the pickup location. His English was perfect. He adapted the tour to our speed and when I mentioned that I was really enjoying the pace, he said that he does that for all clients based on them. He was a great conversationalist, quite knowledgeable about the local history, pointed out some local Olympians we happened to see, took us to a fabulous and inexpensive lunch spot we would not have found otherwise. I would highly recommend him. This was my first TourByLocals experience and Reynier was the perfect guide. I am so very glad we booked him for our trip. He was very fun and expertly knowledgeable. He knew all the right places to go to give us the ultimate Cuba experience. The driver, Ronny, was excellent also. Reynier always found the best restaurants. The diving trip was fantastic and quite the experience. I plan to go back in the future and will definitely be booking another trip with him when I do. I just wanted to say how much we enjoyed our tour with Reynier. He was a very pleasant young man, who had a commanding knowledge of Havana and the history of Cuba. I would certainly recommend him to anyone visiting Havana. I indicated to my guide, Reynier that I was mostly interested in discovering wall murals, and contemporary Cuban Art, and he tailored a three day guided tour of artists studios and points of interest that were just what I was looking for. He was flexible enough to let me explore the Havana Cemetery on our last day together. I appreciated the evening at the National Ballet Theatre. Personable & friendly, I recommend Reynier as a guide! TOUR GUIDE RESPONSE: Thanks Mark for your comment. It was a great pleasure to exchange our art experiences in our different contexts. I enjoyed showing you around but also learning a lot about your interesting stories. Thank for the great time. Reynier was an awesome guide, with great insight into Cuba. The People-to-People tour we did focused on local art, the artists, some history of the city (specifically with schools & churches), as well as some of his favorite restaurants and bars (best meal I had during my week in Habana was for lunch of the tour). We (group of 7) were lucky enough to see him again outside the tour, and got to spend some more time just hanging out. Great guy, great tour, and so def. recommend him for any of your tours. Reynier arranged a top-notch adventure for my group of 7's week-long trip. I can't imagine our trip without him - he arranged seamless services (driver, accommodations) & curated an itinerary that fused our requests w/ smartly hand-picked experiences of Cuban culture. It quickly felt like we were being shown around by a friend - we had a blast doing things we wouldn't find on our own (e.g. free concert at the uni), as well as learning from his deep knowledge of Cuban history & politics. Muchas gracias, R! TOUR GUIDE RESPONSE: Thank you guys for the great time I expended with you. I had an amazing experience showing you around, not only sharing the history and culture of my country but also learning a lot from you all. It was a great pleasure to meet you;Marissa, Katherine, David, Jessie, Frank, Tory and Winston(the best doctor ever) are the best group. Many hugs for all of you and see you soon my friends. We loved Reynier! He showed us all that Old Havana had to offer. More importantly, he shared so much about Cuban life. Reynier was perfect for our group of 6: smart, funny, enthusiastic and interesting. I would recommend Reynier to anyone going to Cuba. Reynier was on time and gave us a nice tour of Havana!! Thanks Reynier!! TOUR GUIDE RESPONSE: Thanks Jody, I had a good time guiding you in Havana. I hope you come back soon to see the rest. Reynier is Super! He is born in Cuba and really knows what he is talking about. Good program, good scedule, speeks very well English. He knows the people of Havana. Dining in typical restaurant. If you are looking for a guide for any kind of tour in Havana, you should contact Rynier! TOUR GUIDE RESPONSE: Raf and his family are all very nice and lovely. They made my first tour a great experience. They were very interested in Cuban culture and history but also we had time to talk about their country and many other subjects. Honestly, I had a great time with them.